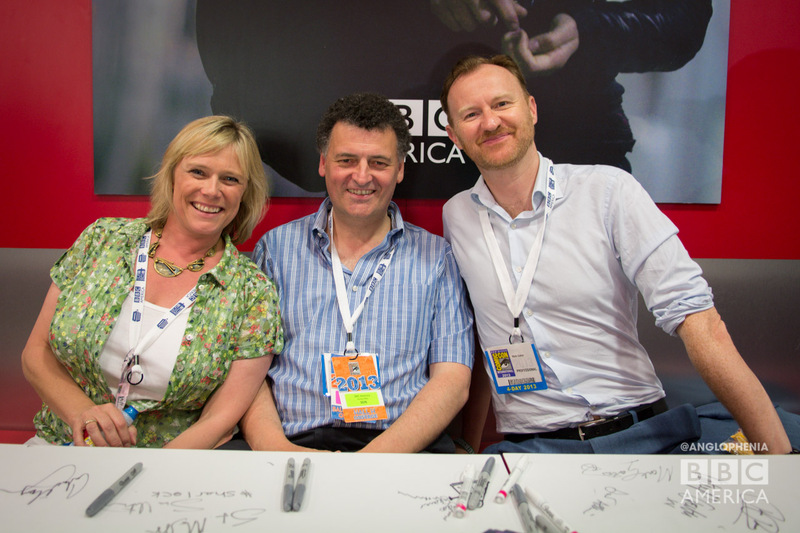 Just in case you missed the furor and flurry of tweets, posts, screams, shrieks, wails, and general hysteria, Sue Vertue (Executive Producer of BBC’s Sherlock), Steven Moffat (Executive Producer/Co-creator/Writer), and Mark Gatiss (Executive Producer/Co-Creator/Writer/and occasional minor civil servant for the British Government), did a Sherlock Season 3 panel at the San Diego Comic Con. 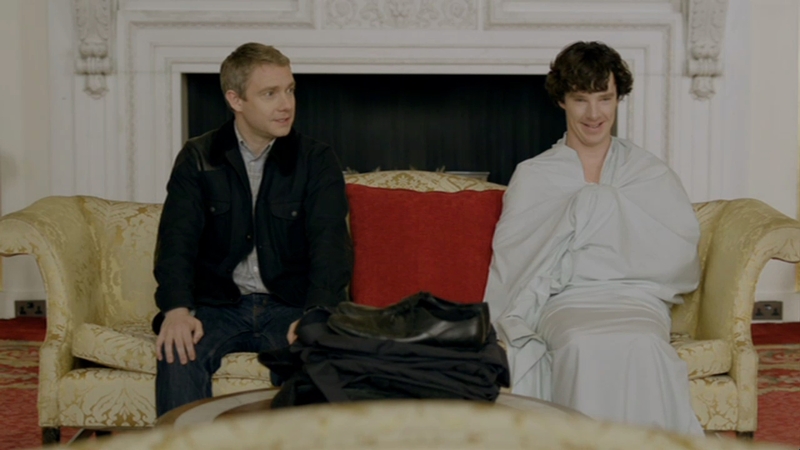 Along with bringing a charming video of Martin Freeman and Benedict Cumberbatch consoling Sherlock fans about their lack of attendance, they brought a brief clip of Episode 2 of Sherlock Season 3 which confirms that “the wedding” alluded to in the three teaser words — Rat, Wedding, Bow — was indeed John Watsons. Apparently, according to those in attendance, the clip begins with Sherlock’s Wedding Speech (and I can only image it to be a decidedly-more-intelligent-yet-equally-obtuse version of the disastrous one from Four Weddings and a Funeral). …it was one of the show’s most flat-out funny scenes in its short history, and it could imply a slight tonal shift in the three 2014 episodes. As Moffat explained, the show has “moved on a bit. There’s slightly more humor.” And tenderness: The scene foregrounds the depth of Watson and Sherlock’s friendship, with a kicker that led to an audible “awwww” in the audience. I’m imagining the Bachelor Party went something like this video. Now I’m getting really anxious and having trouble being a Fan Who Waits. But more on that later this weekend. Also confirmed is that BBC has commissioned a Sherlock Season 4. But you may want to hold your Dance of Joy since no production date has been scheduled — and no Sherlock Season 4 production is foreseen in the near future. Attempting to work out a production plan that can juggle the other professional commitments of Martin Freeman and Benedict Cumberbatch, not to mention the Moftiss, makes D-Day logistics (or SD Comic Con panel coordination) look like organizing the Proust Appreciation Program in Tupelo, Mississippi. On the plus side, everyone reiterated their commitment to continuing the series as long as possible.